BioWare’s ANTHEM has already made its debut at E3 2018 but if you have missed the announcement and were looking for ANTHEM’s final Release Date, Price, Editions, and Pre-Order details then here I have got you covered. BioWare has now officially confirmed that ANTHEM will be released on February 22nd, 2019 for PS4, Xbox One, and PC. Like several other announcements at the event, BioWare also released new gameplay footage of its upcoming shooter game which you can watch below. As I told earlier, ANTHEM will finally be available on February 22nd, 2019, on Xbox One, PS4, and PC. 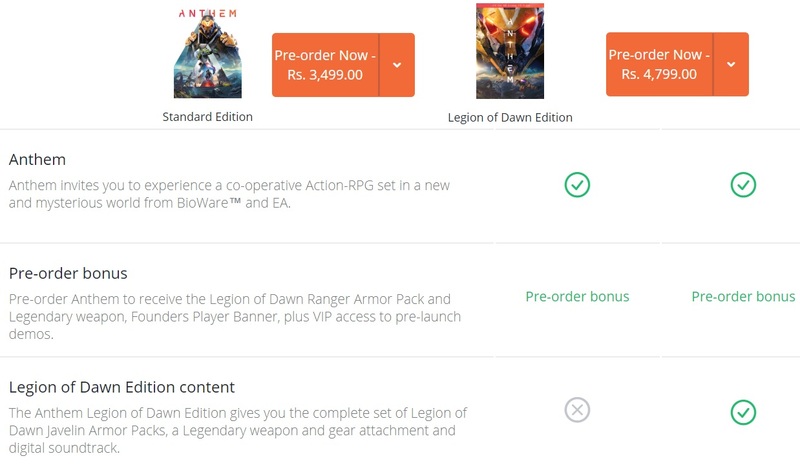 ANTHEM’s both the editions are now available for pre-order which you can order from any of the following platforms. Pre-Ordering the Standard Edition will get you the following bonuses. Pre-Ordering the Legion of Dawn Edition will get you the following bonuses.